Thomas Crane made his first formal appearance in Australia as the legendary Freddie Mercury on the Channel Nine Networks television show “Starstruck”2006 and “Australia’s Got Talent” 2011. His performances impressed audiences and the judge’s panel so much that he reached the finals of the shows. 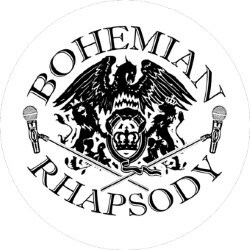 Bohemian Rhapsody was formed by Thomas Crane in 2005, after several years of hard work to find the right members to complete the line-up and present the show we present to you now. This show has received critical acclaim and accolades everywhere it has toured. From the moment Thomas Crane breaks through a plume of smoke onto the stage, this really is “A Kind Of Magic” ! Together, the band has spent countless hours in rehearsals, striving to capture every nuance of Queen’s trademark sound. Countless more hours have been spent as a group, studying every attainable piece of footage of their legendary counterparts in action, hoping to further convince audiences that what they are witnessing is about as close to the real deal as you can get, unless of course anyone has a time machine handy ! It is this level of dedication which has made Bohemian Rhapsody the ultimate tribute to Queen. Coupled with their dedication is their respect towards the music of Queen, and the men who wrote it. As Thomas has said in interviews in the past, “Freddie Mercury was not just another singer to me. He was, and still is, my hero”. These guys are not just another tribute band, cashing in on someone else’s talent and hard work. They may be a tribute band, but they are also Queen fans, and die-hard ones at that. They take what they do very seriously, but they also take it with a great deal of respect and love for the original article. As everyone who knows anything about Queen are well aware, a huge part of the Queen live experience was their stage presence. The flamboyance. The theatrics. With a Bohemian Rhapsody show, none of this is lost in translation. The posturing and preening, the strutting and showmanship. Everything is here. Right down to the trademark cheeky banter and singing contests between Freddie and his audience, Bohemian Rhapsody manage to take everything that made a Queen show unique, and bring it back to life before your very eyes. For those of you who were fortunate enough to see Queen perform live during their reign, this will be a wonderful trip down memory lane for you. For those of you who never got quite that lucky…. The Show Must Go On…. And it does….. with Bohemian Rhapsody !! See you at the show, darlings !! Der Text ist dem Presskit der Band entnommen.